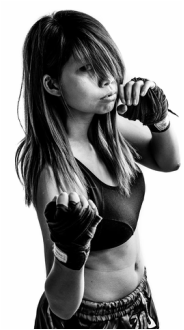 Vivian Chan, our co-founder, founded Encore Muay Thai since 2016. She is also an inspiring serial entrepreneur who started her three businesses at one-go who got featured in the various media, at the mere age of 24. Encore Muay Thai started off as a mixed gym where both females and males trained together in 2016. As time goes by, Vivian realised that there are women out there with similar experiences just like herself and she wants to empower and help them overcome the challenges in life. Hence, it became the first all-female Muay Thai gym in the east of Singapore. No one would be able to guess a small and petite girl like Vivian actually practiced Muay Thai and Boxing for 10 years and participated in various national fights. She got into the sport at the age of 17 because her late uncle inspired and encouraged her. Born in Thailand, this Thai-Chinese girl and her mum were often bullied by their peers because of their petite frame and language barriers. It didn't crumble her, instead she grew so much in the midst of adversity. Women are often being misjudged due to the societal norms and this is what Vivian wants to change. At Encore Muay Thai, not only does the women here learns how to keep fit and improve their physical ability, they are stronger in terms of mental and psychologically. Vivian hopes that the women who trains at Encore Muay Thai will be independent and brave, and when one is tired, head to the gym and soak yin positive energy. Get ready and go one. Vivian is well-known for her cheery personality and positive vibes amongst her business counterparts, peers and family!